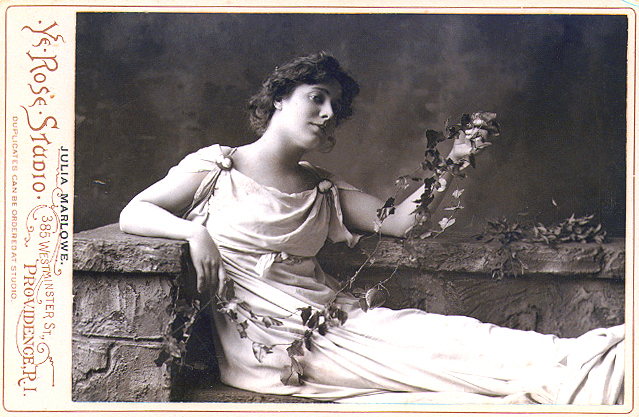 The most intelligent and cultured audience that has assembled in the Lansing Theatre this year last night gathered to do homage to the great genius of Clara Morris . Conspicuous and decidedly pleasing to the eye were the boxes, in which Dr. Giffin and wife entertained the governor and staff and their wives. The gentlemen were all in full uniform and the ladies in elegant evening costumes. To commend, even to speak of the great work done on the Lansing stage last night seems almost presumption. Better work has never been done by any actress in any country. Nothing can be more natural than nature, more lifelike than life. There are heights beyond which even art cannot rise. 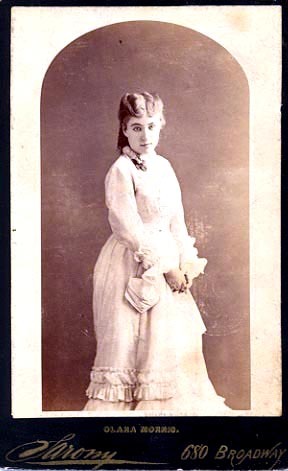 Comment upon the wonderful power of Clara Morris' voice, upon the technical perfection of her acting are utterly unnecessary. One may comment upon excellencies of average acting, but when we find a perfect individual creation, we accept it as unquestioning as we accept nature's work, and upon it we build a whole philosophy of art. 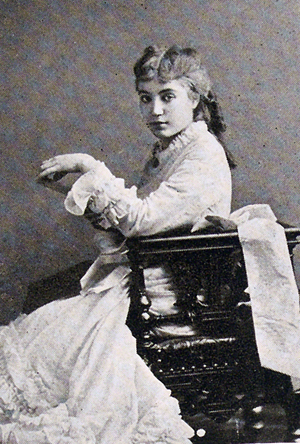 To criticize the way in which Clara Morris dies in "Camille" would be as impertinent as to criticize any real death. One can only say of perfection that it is perfect; we have no adjectives that go any higher; we can only try to see what the great artist does with this creation of hers, and perhaps how she attains her perfection. 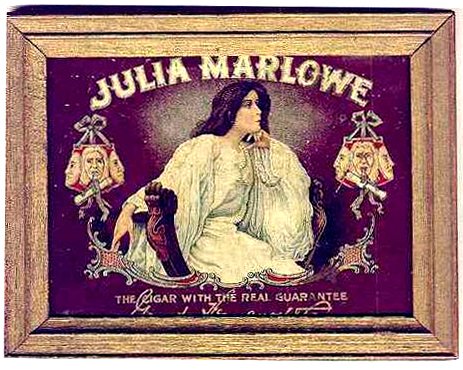 Clara Morris' acting certainly cannot be placed in the same class or viewed in the same light as that of Modjeska and Julia Marlowe in Shakesperian productions. One is the high appreciation and complete sympathy with the great works of the great master, the other is a medley of passions and emotions so great, so boundless that even the most emotional plays of the most emotional age can scarcely give them room to vent themselves. 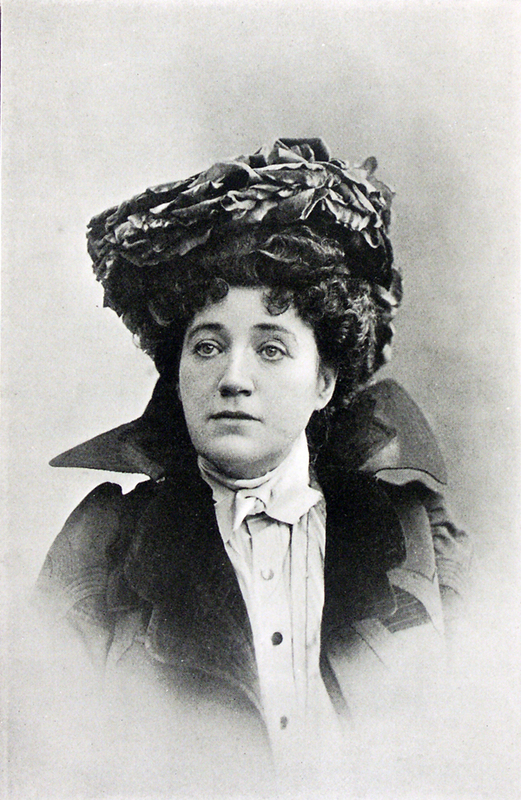 Clara Morris acts by feeling alone. One can see her gestures and poses have never been practiced before a mirror. Sometimes they are almost grotesque in their violence, and her body writhes as though it were being literally torn asunder to let out the great soul within her. "Camille" is an awful play. Clara Morris plays only awful plays. Her realism is terrible and relentless. It is her art and mission to see all that is terrible and painful and unexplained in life. It is a dark and gloomy work that has been laid upon more geniuses than one. But after all is said there is so little said where so much is felt, so much reverenced. There is the terrible scene with Monsieur Duval , the last kiss upon Armand's forehead which was pure as a wife's, holy as a mother's, and the last embrace which was restrained, which are beyond all words, which we can only remember and shudder and suffer at the memory. Men cannot say where art gets its beauty, where power gets its strength. The greatest perfection a work of art can ever attain is when it ceases to be a work of art and becomes a living fact. Art and science may make a creation perfect in symmetry and form, but it is only the genius which forever evades analysis that can breathe into it a living soul and make it great. To remember the many laughs caused by the mishaps of Pottgeiser and others who figure in the dramatic story is to break into a broad smile. Loder is quietly natural and excessively droll, every look, gesture, raise of the eyebrows, etc., indicating something to laugh at. In "Oh, What a Night" there are a thousand laughs for the audience that will assemble at the Lansing theatre tonight. Dr. Giffin: Physician and surgeon Dr. Robert Emmett Giffen (died c. 1919) had his offices in the Lansing building in 1893 and 1894 and lived at 1504 S Street, near Chancellor James Canfield's house at 1522 S. He came to Lincoln in the late 1880s, serving as one of the surgeons at St. Elizabeth Hospital by 1890.Robert Emmett (1778-1803) was an Irish patriot executed by the British for his part in the 1803 rebellion. 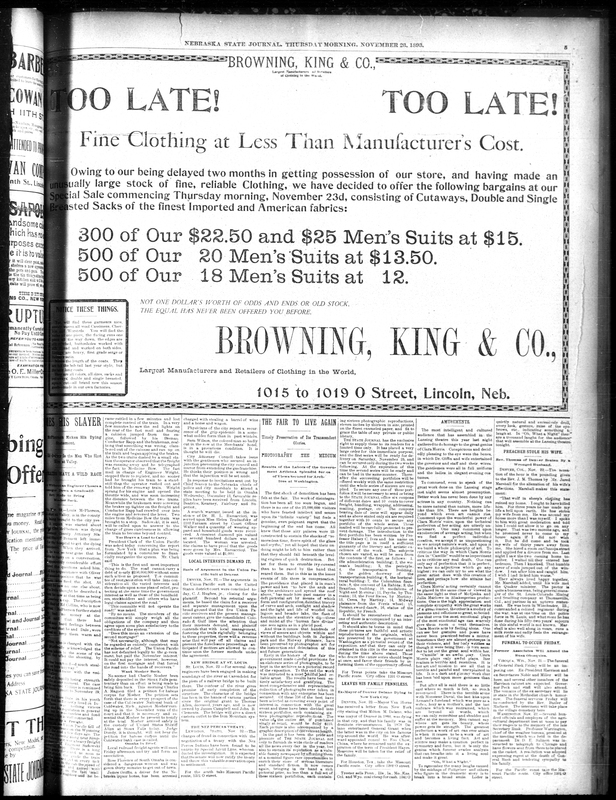 Robert Emmett Moore of Lincoln employed Charles Cather during the 1890s. Cather named one of the two businessman friends in "Two Friends" (1932) Robert Emmett Dillon. 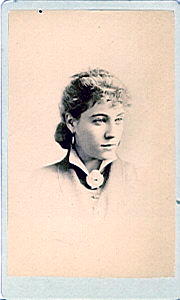 Wife: Helena L. Giffen was the wife of Dr. Robert E. Giffen; c. 1907-1913 she had her own business selling hair goods. the governor: The governor of Nebraska was then Lorenzo Crounse (1834-1909) of Ft. Calhoun, NE. He was born in New York state, served in the Civil War, and came to Nebraska in 1864. He served in the territorial and state legislatures and in Congress 1873-77. He was appointed Assistant Secretary of the U.S. Treasury in 1891 but resigned to run for governor, and served 1892-95. He declined to run for re-election. In full uniform: The governor was ex officio commander-in-chief of the Nebraska National Guard; his staff in that capacity would have consisted of the adjutant general, the quartermaster general, the surgeon general, the commissary general, and their assistants. emotional plays . 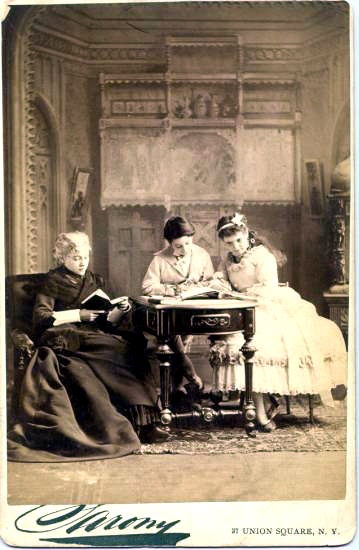 . . emotional age: Audiences in the Victorian era loved plays in which the characters are dominated by strong emotions in tense, powerful scenes which gave the actors opportunities for thrilling speeches and gestures. 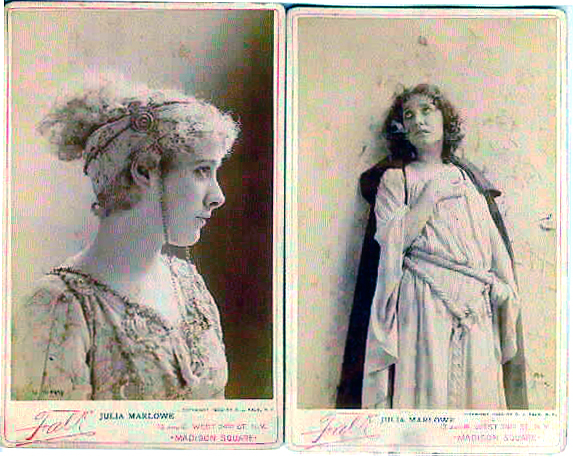 The term melodramatic is now often applied to such plays, although melodrama was originally a separate genre. 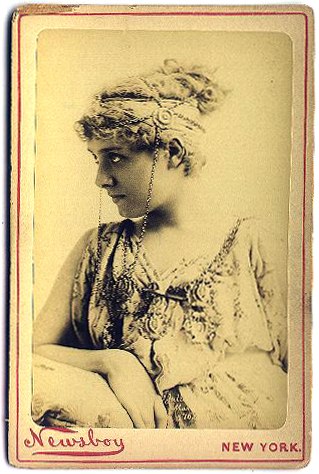 never been practiced before a mirror: Morris's memoirs and articles on the art and craft of acting show that she did indeed study how to play her parts, visiting insane asylums, for example, before playing roles in which she went mad. However, critics felt that the key to her power was that she actually felt the emotions her characters were feeling. awful: Cather uses the word in its older sense, as something inspiring awe by its grandeur or power. Monsieur Duval: The father of Camille's lover, Armand, who separates the lovers by appealing to Camille to give up Armand for his own good and that of his family. Armand: Armand Duval, Camille's idealistic lover. 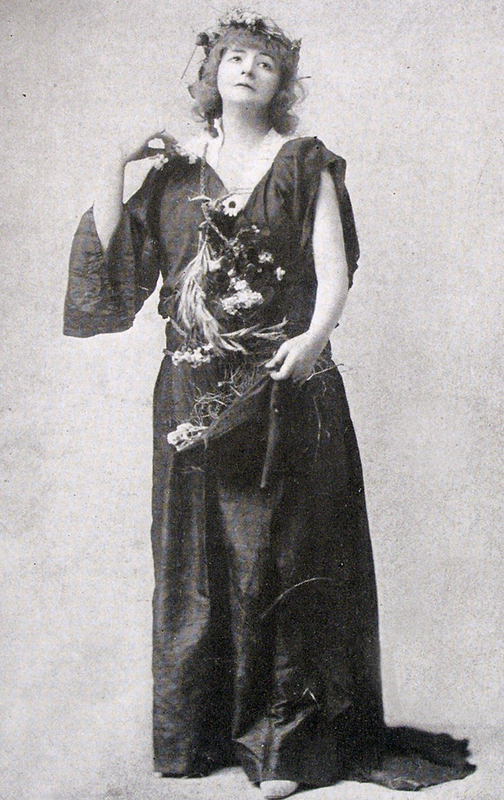 When he believes that Camille has tired of him and has returned to her old life, he denounces her at a ball, causing her collapse into her final illness. When he learns why she left him, he returns to her and she dies in his arms. Pottgeiser: Major Herman Pottgeiser, "a German-American of a somewhat conventional, but ever-welcome, type recurs with the persistency of a Wagnerian leading motif," and furnished much of the humor of William Hoey's Oh, What a Night, according to the New York Times reviewer (29 December, 1885). Loder: No actor of the name of Loder appeared on the New York stage in the 1890s, according to the New York Times dramatic index. He was probably a part of one of the many companies touring the Midwest. 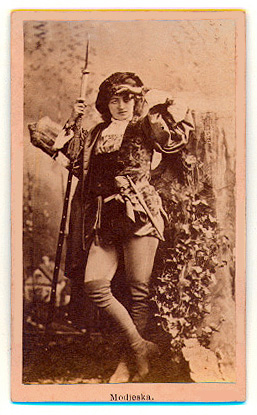 Oh, What a Night: Gus Williams starred in William Hoey's Oh, What a Night, "a farcical piece with which he has lately delighted rural audiences," when it opened at the Grand Opera House in New York on December 28, 1885; the New York Times reviewer went on to suggest that the play was probably based on foreign sources (29 December, 1885).